How are such mapping initiatives self-governed or in other words how do groups of citizens co-create information through the use of maps? How is this information (maps) made operable in the real (offline) world? Does it support the diffusion of alternative practices (community gardening, CSA, sharing, etc.)? This research is part of a PhD project (link) and contributes to inform the TransforMap initiative. In this third report from my exploration of the field of maps for sustainability transitions I have conducted two interviews with two online platforms enabling urban foraging (or harvesting) of edibles (fruits and herbs): Falling Fruit and Mundraub. Urban foraging/harvesting consists in picking up the fruits or other edibles that grow in the city and usually go to waste. Here are two fantastic initiatives! The current world map is born from the connection in 2013 of two early US urban foragers, Caleb Phillips and Ethan Welty, who had been respectively mapping fruit trees in Boulder, Colorado, US as early as 2008. The map consists of trees that are located by individuals like Caleb and Ethan, but also of open data originating from municipalities across the world. As the result of this hybrid approach there are a massive 788 000 edible trees referenced… For each tree users can leave a report, pictures, and edit the description without login. Focus is mainly on data and the map is entirely supported by volunteer contributions from the founders, so the design is a relatively dry google map, but working very smoothly, including handy filtering options. Mundraub is a similar map that focuses on German-speaking countries. Founded by Kai Gidhorn, it started in 2009 as a simple Google Maps similar to Falling Fruit. However, quite soon, the Berlin-based initiative was selected as part of a national competition for sustainable innovations and this allowed to develop a website and a map with beautiful icons, but also develop the community side of Mundraub. Now Mundraub claims 25 000 users and is in rapid growth. Supported by a team of around 5 paid staff, the map displays around 17 000 trees and bushes with beautiful icons. An important distinction from Falling Fruit is that all trees on the map have been added by users over the years. So far, it has been chosen to produce original data, not relying on existing (municipal) inventories. The map is only a part of Mundraub.org which maintains a website with regular news, organize foraging tours in various cities in Germany, and started in 2015 a substantial project on sustainability, regional consumption and the relationship with nature funded by the German ministry for Education and Research. In the two cases, one can identify two elements as being the resource that is shared by a number of users. Another crucial component of the resource here, is the data itself: each point of interest (POI). As mentioned above, Falling Fruit and Mundraub have a slightly different approach. The first one compiles both original data crowdsourced through its platform and open data from third party inventories. This has enabled a massive amount of data to be displayed quickly across the world. However, it is impossible to check the validity of each POI individually, which can only happen over time and the development of a large community of contributors. Mundraub, however, relied exclusively on original data. The main reason is that of the technical difficulty to import such large data sources – the organization lacking the know-how to do it, as it relyies on freelancers for the technical work. This said Mundraub is willing to slowly integrate open data to expand the number of POI (i.e. trees/bushes). Again, the two mapping platforms differ on some aspects. To add a new point on Mundraub you need to be logged in with your profile. The reason behind is data validation and liability. Before the integration of a login on mundraub.org, each point was checked individually by its team – actually mainly by its founder Kai, who quickly saw a lot of his time being consumed by the task. In addition, multiple cases appeared where trees located on private land where mapped by contributors triggering angry reactions from the owners. In order to avoid having to endorse directly the responsibility of mapping private trees and facilitate data management, a login was installed, allowing users to be responsible for their own edits, including with removing trees which were signaled by other contributors or owners as not public. In the last two years, we have only received a few complaints from homeowners about a location on or bordering their property. As we consider natural resources existing separate of any geopolitics, we refuse to delete a location unless it no longer exists or listing it on the map puts it at risk (e.g. a threatened wild species). Instead, these complaints were resolved by updating the location (e.g. “The current owner has requested that no one pick their fruit tree.”) and showed the plaintiffs how to edit the locations themselves in the future. People relax once they realize that they too have control over the content of the site. Even while Mundraub users do have an online profile, there isn’t yet much opportunities for online interaction. This happens at some level on Facebook with three groups (Germany, Austria, Hasetal). Offline, ‘Mundräubers’ do meet, in particular in Berlin, where several harvesting tours have been organized directly by the organization or by contributors themselves. In the case of Falling Fruit, the absence of login is still compensated by the possibility to register its email address and receive updates with custom settings (e.g. geographic range). Founders Ethan and Caleb also report that existing communities such as Transition Goshen (Goshen, Indiana), Eat Wild (South Bend, Indiana), PIXXE (Warsaw, Poland), or Transition Cambridge (Cambridge, UK) use the platform within their activities. Being faced with regular discontent from tree owners, but also from contributors who have reported others predating on the public resources, Mundraub has developed a brief set of rules to encourage contributors to have a respectful behaviour of the trees and the surrounding nature, share their harvest and discoveries, contribute back to the place where they forage by taking care of the trees for example and possibly further planting, and lastly avoid breaching private property. Falling Fruit hasn’t developed such rules, but it is possible and encouraged to indicate for each tree if it is public or private (and then if the owner agrees for others to harvest). Both maps have put at the center of their mission to reconnect people with their natural environment and ultimately with the botanical origin of food. Mundraub wants to its users to experience an edible landscape and shape it collectively. Both also obviously emphasize the idea of avoiding fruit waste and providing a source of food free to all. In quantitative terms, it is difficult to systematically evaluate the onland/offline practices. On specific occasions though, Mundräubers have produced up to 20 000 Liters of apple juice. Online, the high traffic of the two websites (1000 visitors/day for Falling Fruit with a peak to 100 000 after a Yahoo article) shows a large number of people are reached. Both have been featured very frequently in mainstream media those last two years and display impressive press portfolio with mainstream coverage. This has had the direct effect to push the number of Mundraub’s users up: from 24K at the time of the interview on 4.05.2015 up to 25K mid-July. With the growing number of users, more points are being mapped. A direct impact of the two platforms has been to produce new and original data (over 17K POIs for Mundraub and 20K for Falling Fruit) which was either non-existing or not publicly accessible. In addition to producing original data, Falling Fruit also brought together in one user-friendly map dispersed tree inventories which were sleeping on municipality websites, or worse, on hard drives in municipal offices. In one case, the city of Austin, Texas, contacted Falling Fruit to publish its inventory and encouraged its citizens to pick up fruits. Beyond the obvious benefit it has for their users, the aggregation of such data in one place may also prove useful to urban ecologists studying urban biodiversity or edible landscapes for example – as is already the case with Mundraub collaborating with researchers who analyze its data. 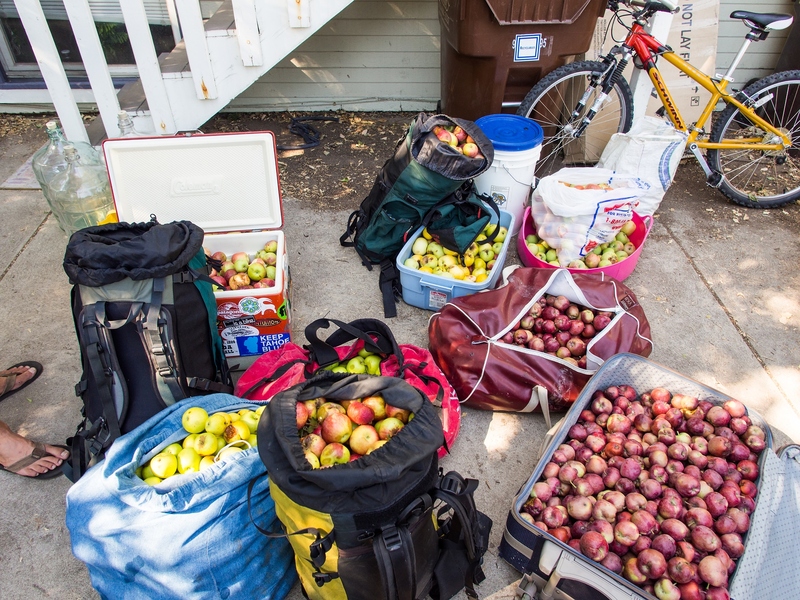 500 pounds of apples picked from neighborhood trees in a couple hours by Ethan Welty and Jeff Wanner in Boulder, Colorado on September 9, 2012. The duo pressed the apples into cider using Welty’s apple press and fermented the juice into hard apple cider. On a more problematic level, the publicization of the trees has generated some conflicts. As mentionned some private owners complained their trees where shown on the maps. However, as mentioned above, this issue seems to have been solved – differently – by both initiatives. Another problem that is more difficult to address and has been isolately reported is connected to predatory harvesting, with users, or locals complaining about foragers stripping trees naked not leaving a fruit for others. Mundraub, more advanced on the development of its community makes a lot of efforts to address the issue with aforementioned rules, but also exploring models and actions where the community could be the catalyzer for planting more trees, caring for them. What does this mean from a transition perspective? When it looks at the diffusion of (grassroots) innovation the transition literature has identified three main processes: replication of innovations from place to place, translation of the innovation to the mainstream, and scaling up the innovation (Seyfang and Longhurst 2014). Falling Fruit and Mundraub clearly facilitate the three. Replication. Falling Fruit, with its multilingual interface and imports of municipal inventories is active across many countries. Generally, the two maps support the replication of the practice of urban foraging from city to city, but also outside urban areas. Translation. Both initiatives received considerable and positive attention from mainstream media, in particular in the last two years. This is a considerable achievement as the traditional practice of gleaning (or foraging or harvesting) received little to no attention for a long time, being marginalized by society. Proof of this are ongoing contact with interested local governments and substantial public support (for Mundraub only). Scaling. This is probably the more problematic dimension. Indeed, the practice of foraging when scaled up (eg. one user systematically and intensively picking fruits) sometimes leads to conflicts between users and stakeholders. However, up-scaling can find a collaborative form as in the case of Mundraub collaborating with other stakeholders by organizing large and collective harvesting sessions where the produce is shared among and beyond harvesters. In other words, the adverse effect of such upscaling can be avoided through commoning. Gill Seyfang, & Longhurst, N. (2014). Understanding the diffusion of grassroots innovations for sustainability: An international study of community currency niches. (2014-25).